Shawanda Holmes lived with her children at this house in 2015, when a blood screening showed that her son had extremely elevated lead levels. But his result came back more than four times the level that indicates lead poisoning. He was so severely lead-poisoned that he needed to go to the hospital. The state Department of Health would have to inspect the Central City house the family had rented for about a year to find the source of the exposure. “[The inspectors] said [lead] was on everything that he touched. They tested the walls, they tested the floors, they tested the windows, they tested the mantelpiece, they tested everything,” Holmes said in an interview with The Lens last year. More testing showed her then-five-year-old daughter Saniyah had also developed lead poisoning. Then the Department of Health gave her more news: The state had found lead hazards in the house two years earlier. Officials wanted to know why the landlord had rented to a family with children. The landlord, John Taylor, told The Lens in an interview he had remediated lead hazards in the house and yard in 2013 after the house was first inspected. But he said the state did not follow-up and conduct a clearance inspection to confirm the house was safe for children. Records obtained by The Lens from the Department of Health show only an initial inspection, no follow-up. That should not have happened. State health officials should have returned to the house and conducted a clearance inspection to ensure lead hazards were removed from the property, according to Trina Evans Williams, state program coordinator of the Louisiana Healthy Homes Childhood Lead Poisoning Prevention Program. If the landlord didn’t fix the hazards, a warning to potential occupants of lead hazards should have been affixed prominently to the entrance of the house, and children age six and under should not have been allowed to live there. If the notice was removed, the state should have fined the landlord. But there was no clearance inspection, and two years later, Holmes’ children were sick. Lead is a neurotoxin that is especially harmful to children and causes permanent brain damage. There is no safe lead level for children, according to the American Academy of Pediatrics. When a child’s blood lead test result is at or above the reference level, the lab alerts the state, which coordinates intervention. If the occupants consent, inspectors test their home for lead. “It’s something we put on the actual property,” Evans Williams said. The notice states that there are lead hazards in the property and that no children six years and younger should live there. A landlord faces a $500 fine for removing the sign. To lawfully remove the notice, a risk assessor certified by the Environmental Protection Agency has to re-inspect the house and determine hazards are gone. “Usually landlords start doing the work when the home gets posted,” Evans Williams said. Evans Williams said that the public notice protects children from the property even after current tenants move out. “If a child moves and the property received an initial environmental assessment, LHHCLPPP will provide follow-up until the property is cleared from lead hazards,” Samantha Faulkner Hartmann, a spokeswoman for the Department of Health, said in a statement late last year. Enforcement of the rule appears weak and follow-up is imperfect. As of late last year, the state had collected $0 in fines, though from late 2015 to late 2017, state records show dozens of homes have been posted. Officials did not respond to repeated requests for updated information about fines collected. The Department of Health says it is not certain what agency is supposed to collect the fines. “Although R.S. 40:1299.24 references a fine of $500 for unauthorized intentional removal of a posted sign, it does not indicate which agency is responsible for levying the fine. To date, no fines have been collected,” Faulkner Hartmann said. The lead prevention program does not have the authority to enforce lead hazard remediation, nor “removal of children from homes with lead hazards,” Kelly Zimmerman, a Department of Health spokeswoman, said last week. Taylor has owned the First Street property since 2001. Taylor told The Lens that after the state inspection in 2013, he remediated hazards by covering lead paint and putting a layer of uncontaminated soil over the yard. He said the state never came back to conduct a clearance inspection, and the state never posted a warning on the property. In an email Zimmerman said that under state program rules, it is the responsibility of landlords to contact the state program to set up a clearance inspection after they have addressed lead hazards. Notes from state caseworker Ann Bludsaw in March 2013 describe communicating with the landlord about inspection and follow-up. Taylor “voiced an understanding of abating the house, and will receive inspection report with a deadline to abate and will receive clearance inspection,” she wrote. In April 2013, the report from the initial inspection was sent to Taylor. In June 2013, Bludsaw spoke to Taylor, who told her that the family affected by lead had moved to a house free of hazards. But the next communication in the record is two years later. In that time, Taylor rented the house to Holmes and her young children. There is no record of the state following up on the house to ensure it was clear of lead hazards. Holmes said she did not know about the house’s past problems when she moved in. Taylor disputed that, saying he told her about the issue. He added that despite his warning, Holmes and her housemates sanded and painted the walls and woodwork, potentially releasing lead back into the house. As there was no clearance inspection, The Lens does not know if Taylor succeeded in removing the house’s hazards. If the state program had followed up and found remaining lead hazards, the house may have been posted. In that case, a child should not have been allowed to live there without the family knowing the risk. The state program does not inform the city government about lead-contaminated properties or postings, Zimmerman wrote in a statement. Mayor LaToya Cantrell’s office has not responded to The Lens’ questions about this story. State inspectors asked Holmes about the circumstances under which her family rented the house from Taylor. After they identified lead hazards all over the house, Bludsaw told Holmes that she needed to leave within three weeks, as the house would be posted for lead hazards and children would not be allowed to live there. “I had no choice but to move out. It was not livable,” Holmes said. 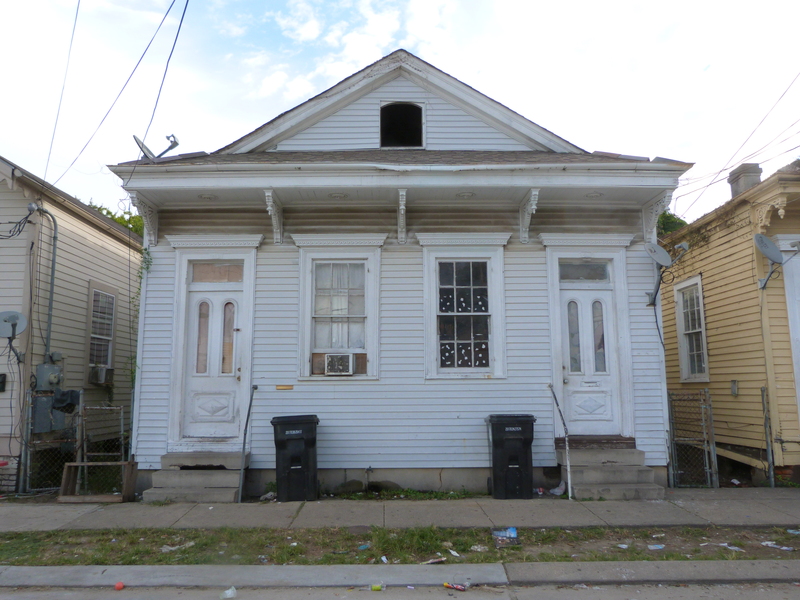 Holmes said she received no state assistance to move, and the Freret Street house she found on short notice had such bad mold problems that her daughter fell through the floor. She sought help from Hannah Adams, a lawyer at the Southeast Louisiana Legal Services. In 2016, Holmes filed a civil suit against Taylor and Residential Holdings, Inc, his property management company. Residential Holdings owns ten additional New Orleans properties, according to the city assessor database. Taylor said he had to repaint another of his properties, at 2609 Dryades Street, after state inspectors found lead hazards there. Holmes later testified before the City Council in support of then-Councilwoman Cantrell’s proposed rental registry, which would have required periodic inspections of rental units. The proposed inspections would not include a complete lead hazard risk assessment, which identifies hazards that typical visual inspections cannot, according to Emily Benfer, visiting associate clinical professor of law at Columbia Law School and director of the Health Justice Advocacy Clinic, which works on lead-related advocacy and policy. The registry proposal was opposed by many landlords, and there were questions about its legality. It was shelved without going before the full council for a vote. Lead hazards are part of a broader citywide problem, said Max Ciardullo, director of policy and communications at the Greater New Orleans Fair Housing Action Center. Even if a house passes a state-sponsored lead inspection, it may not be safe for children. Passing inspection means the levels of lead concentration found in the house — whether dust, paint, soil, or water — pass under current standards set by the Environmental Protection Agency. But critics say those standards are inadequate and leave children at risk for lead poisoning. In June 2018, the EPA announced it would propose stricter standards for allowable lead dust levels in houses, after being sued by a coalition of activist groups. “The EPA’s proposed standards are still not protective enough,” said Benfer, who recommended even more stringent lead dust standards to the EPA. Now five years old, Louis has just started kindergarten. His lead level has been up and down for the past three years, Holmes said in an interview last week. And while it has gone down lately, it has never gone below 5 micrograms per deciliter, the national reference level. Due to problems in other housing, he now has asthma that is so severe he needs to use a breathing machine twice per day, Holmes said in an interview last week. The family moved three months ago to a newly built house, and Holmes feels confident it has no lead-based paint. In September 2016, the house at 2417 First Street passed a clearance inspection. There are no children currently living there. Meanwhile, Holmes’ lawsuit has stalled. She said she has not heard from her lawyer, Allen Borne, in over a year and a half. Borne did not respond to requests for comment. Louis’ last blood lead test two months ago showed his level at 6, which the Department of Health still considers lead poisoned. Holmes says she wants to have him evaluated for ADHD, a known effect of lead poisoning. This story has been updated to reflect Emily Benfer’s current job titles. *Clarification: After this article was published, a Department of Health spokeswoman told The Lens that John Taylor, the owner of the First Street house, failed to contact the state in 2013 to request a clearance inspection for the house. Kerry Nix was a staff writer for The Lens. Her work previously appeared in Pittsburgh’s PublicSource and Wesleying.org, a student-run publication at her alma mater. She graduated from Wesleyan University with majors in economics and Italian studies and a minor in environmental studies.